NY1's Stephanie Simon visits Ailey II's artistic director, Troy Powell, and dancers Corrin Rachelle Mitchell and Leonardo Brito, for a sneak peek into Powell's first work for the company, Ebb and Flow. Ailey II will be performing at NYU's Skirball Theatre March 13-17. When Troy Powell talks about the power of dance, you can almost see his face light up 600 miles away in Red Wing, Minn., where the Ailey II dance company is performing a week before arriving in Toledo. "We are all dancers in our own right," the artistic director says with the zeal of a missionary. "When I say dancing, I mean everyone is born to move. Everyone's born with a rhythm, that heartbeat or tone." Troy Powell is carrying on the legacy of legendary choreographer Alvin Ailey with Ailey II, the young, 12-member dance company that will perform tonight at the Aspen District Theatre. Powell, the artistic director of Ailey II, has spent nearly his entire life exploring and performing Ailey's groundbreaking work reflecting the African-American journey. Destination Dance, the Alvin Ailey American Dance Theater’s initiative to produce year-round programming in Atlanta, will wrap up its pilot season this weekend with performances that could launch a locally based choreographer to new heights. Juel D. Lane will make his choreographic debut with Ailey II, the organization’s second company, with “Touch & Agree (2017),” which premieres Oct. 21 alongside Renee I. McDonald’s “Breaking Point” and Ailey’s “Revelations” at the Rialto Center for the Arts. March 29 to April 2, the Alvin Ailey Repertory Ensemble, also known as Ailey II, swings into New York fresh off a 25-city tour for a two-week engagement at NYU Skirball center. It's the last hour of an exhausting, all-day Ailey II rehearsal. Troy Powell, the company's artistic director, has just called for a five-minute break. The Manhattan skyline is the perfect backdrop for Troy Powell's Advanced Beginner Horton Technique class at Alvin Ailey studios. The parallel and perpendicular lines of skyscrapers and apartment towers seen from the windows of the fifth-floor studio mirror the shapes every student in the crowded room is striving for. 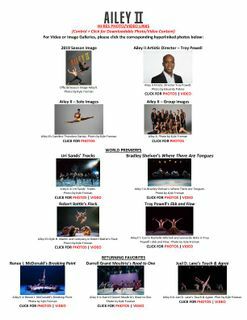 In the last weekend of September, the final two performances on Sunday the 28th, will feature renowned dance company Ailey II. 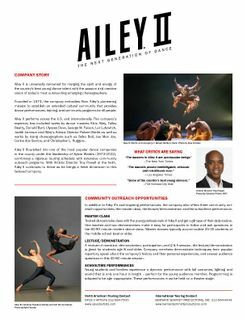 Artistic director of Ailey II, Troy Powell, said they will be sending a team of 19 people, including 12 dancers.